Yad Vashem is Israel’s official memorial to the Jewish victims of the Holocaust, established in 1953 through the Yad Vashem Law passed by the Knesset, Israel’s parliament. The name “Yad Vashem” is taken from a verse in the Book of Isaiah. Naming the Holocaust memorial “yad vashem” conveys the idea of establishing a national depository for the names of Jewish victims who have no one to carry their name after death. The following 15 Pages of Testimony will give you a proper feel of where the remaining other millions of souls who suffered this unfathomable agony would have taken you. That’s all you need to feel. Feel for 15, you’ll feel for 6 million. If you don’t feel you’re either a nazi and/or some sick f___k. 1. MARA COBLIC, daughter of Yitzhak and Bracha Coblic, was born in 1936 in Chisinau, Romania (today Moldova). Mara and her family were incarcerated in the Chisinua ghetto, where she and her mother perished. The Page of Testimony in her memory and the photograph were submitted to Yad Vashem by Malka Gipsman, Mara’s cousin. 2. THE GRITZ FAMILY Chaya Gritz (ne Zuckerman) was born in Berezno, Poland in 1906.She married Jacob Nianje Gritz, also from Berezno, who was three years her senior. In 1933, their daughter Ettele Menucha was born. The family was incarcerated in the Berezno ghetto, where they were murdered by the Germans and their Ukrainian collaborators in August 1942. The photograph and Pages of Testimony in their memory were submitted to Yad Vashem by Yishayahu Perry, Chaya Gritz’s nephew. 3. 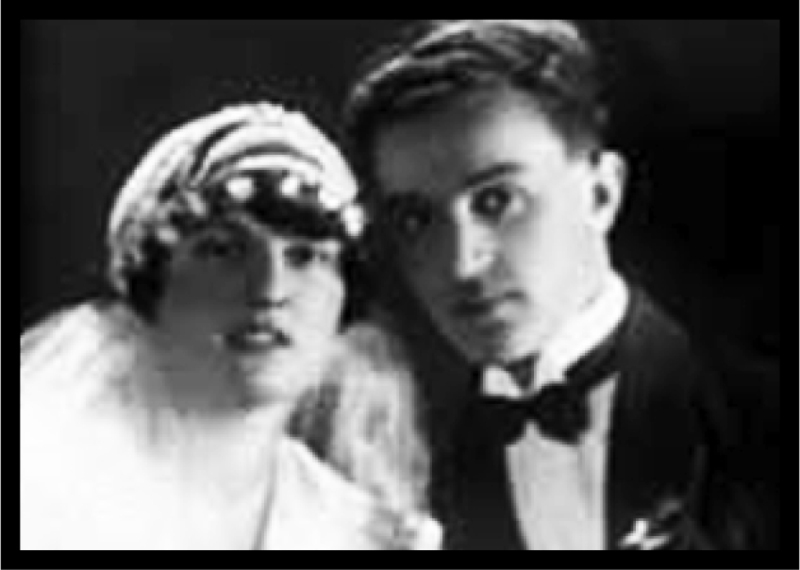 ARTU and TRUDA RUBIN on their Wedding Day. Artur Rubin was born in 1901 in Dobris, Czechoslovakia. He was married to Truda Kaplusz, born in Dobris in 1907. Artur was a trader and Truda was a housewife. In 1944, they were deported to Auschwitz, where they were murdered. Artur was 43 and his wife was 37. The Pages of Testimony in their memory and the photograph were submitted to Yad Vashem by Vera Karger, the Rubin’s niece, living in the United States. 4. SARA LIVSHITZ daughter of Moshe and Riva (nee Shoikhet), was born in 1938 in Vinnitsa, Ukraine. In 1941, she was murdered in Vinnitsa, together with her parents, and her brother Daniel, age 6. She was just 3 years old. The photograph and Page of Testimony in her memory were submitted to Yad Vashem by her cousin, Dora Vernikov, who live in the Ukraine. 5. HEINRICH and MARGARETE JACOBY BERLIN, 1940 Heinrich Jacoby was born in Belgard, Germany on October 15, 1864. His wife Margarete was born in Eidtkonen, Germany on November 11, 1875. They were deported from Germany and perished in Theresienstadt on January 18, 1943, age 79, and Margarete on August 22, 1943, age 68. The Pages of Testimony in their memory and the photograph were submitted by their daughter, Julia Faerber Jacoby, who lives in France. 6. FLORIKA LIEBMANN was born in 1934 in Szeged, Hungary to Bela and Szerena (née Hortobagyi) Liebmann. She went to school in Szeged, and in 1944, at the age of 10, was deported to her death. Her mother also perished. The photograph and Page of Testimony in her memory were submitted to Yad Vashem by Moshe Hortobagy. 7. YEHIEL MINTZBERG Son of Abek (Abba) and Miriam Mintzberg, was born in Radom, Poland. He lived in Radom during the war, until October 1942, when he was deported to Treblinka, and murdered. He was ten years old. The Page of Testimony in his memory and the photograph were submitted to Yad Vashem by his aunt, Lola Politanski from Israel. 8. KURT PECKEL FAMILY. Kurt, son of Adolf and Pauline Peckel, was born on 9 March, 1897 in Inse, Germany. He married Frania Kalter, and they had a son, Adolf. The family lived in Leipzig, Germany, and during the war they were in Southern France. On 31 August 1942, Kurt, Frania and Adolf were deported on the 26th transport from the Drancy transit camp to Auschwitz, where they all perished. The family photograph and Page of Testimony in memory of Kurt Peckel were submitted to Yad Vashem by Horace Peck (formerly Peckel), Kurt’s brother from the US. 9. GREGORY SHEHTMAN Gregory, son of Haim and Feiga Shehtman, was born in Kiev, Ukraine in 1934. In September 1941, Gregory was taken to Babi Yar, a ravine just outside Kiev, and murdered. The photograph and Page of Testimony in his memory were submitted to Yad Vashem by Rachel Gorinstein, Gregory’s half-sister, who lives in the US. 10 OLGA KRAUSZ & HER SON IMRE Olga Krausz, daugher of Lajos and Janka Blumenfeld, was born in Satoraljaujhely, Hungary in 1905. She was married to Jozsef Krausz, a doctor by profession. Olga was a teacher. In 1938 they had a son, Imre. During the war, the Krausz family lived in Pecs, Hungary. They were all murdered in Auschwitz in 1944. The photograph and Pages of Testimony in their memory were submitted to Yad Vashem by Gustav Grtner, Olga’s nephew, who lives in the Czech Republic. 11. LAURA & VILIAM SCHWARTZ Laura Schwartz, daughter of Margit and Ede Hadinger, was married to Viliam Schwartz, and was a pharmacist by profession. The couple lived in Cluj, Romania. Laura perished at the age of 28, probably in a concentration camp. Viliam’s fate is unknown. The photograph and Page of Testimony in her memory were submitted by her cousin Carol Rosenfeld, who lives in Sweden. 12. RENEE ALBERSHEIM Renée, daughter of Fritz and Helene Albersheim, was born in Berlin, Germany in 1930. During the war the family lived in Lithuania, Helene’s country of origin. Rene and her parents were incarcerated in the Kovno ghetto, where they perished. The Page of Testimony in her memory and the photograph were submitted to Yad Vashem by Tamara Jawschitz-Spatz, Renes’s cousin. 13. MARINA SMARGONSKI Marina, daughter of Nahum and Anna-Nyuta Smargonski, was born in Riga, Latvia on 30 August 1938. During the war the family lived in Riga, and Marina perished in the Riga ghetto in December of 1941. She was 3 years old. Her father perished in a concentration camp in Germany. The photograph and Page of Testimony in her memory were submitted to Yad Vashem by Anna Yarshov (formerly Smargonski), Marina’s mother. 14. AMARA HALPERN with one of her two daughters – Lita or Ruth. Tamara Kessel was born in 1903 in Riga, Latvia, and married Abraham Halpern, also born in Riga. They had two daughters – Lita, born in 1929 and Ruth, born in 1931. The family lived in Riga during the war. None of them survived. The Pages of Testimony in their memory and the photograph were submitted by Shirley Morgenstern, Tamara’s cousin. 15. ELISABETH GERSCH AND DAUGHTER, EVA Eva Elisabeth Gersch (née Grunfeld) was born in 1914 in TG-Mures, Transylvania (Romania). She was married to Rudolph and they lived in Deda Bisztra, Romania where Elisabeth was a housewife. In 1936 they had a daughter whom they named Eva (in photograph). During the war, the family lived in the Regin ghetto. Elisabeth and Eva were deported to Auschwitz, where they were gassed in 1944. Elisabeth was 40 and Eva was 8 years old. The photograph and Pages of Testimony in their memory were submitted to Yad Vashem by Elisabeth’s niece Adela Ganea, herself a Holocaust survivor, living in Haifa. The Shoah Victims’ Names Recovery Project aims to memorialize each individual Jew murdered in the Holocaust by recording their names, biographical details and photographs on special forms created by Yad Vashem, called Pages of Testimony. Pages of Testimony are special forms designed by Yad Vashem to restore the personal identity and brief life stories of the six million Jews murdered by the Nazis and their accomplices. Since its inception Yad Vashem has worked tirelessly to collect these one-page forms, containing the names, biographical details and, when available, photographs, of each individual victim. Pages of Testimony are submitted by survivors, remaining family members or friends and acquaintances in commemoration of Jews murdered in the Holocaust. The first 800,000 names on Pages of Testimony were collected during the 1950’s, with ongoing global outreach efforts to identify the unnamed victims of the Shoah so they will always be remembered. To date there are some 2.5 million Pages of Testimony, written in more than twenty languages, stored for perpetuity in the circular repository around the outer edge of the Hall of Names, with space for six million in total. Empty shelves bear witness to the millions of individuals who have yet to be memorialized. The main circular hall houses the extensive collection of “Pages of Testimony” – short biographies of each Holocaust victim. Over two million Pages are stored in the circular repository around the outer edge of the Hall, with room for six million in all. The ceiling of the Hall is composed of a ten-meter high cone reaching skywards, displaying 600 photographs and fragments of Pages of Testimony. This exhibit represents a fraction of the murdered six million men, women and children from the diverse Jewish world destroyed by the Nazis and their accomplices. The victims’ portraits are reflected in water at the base of an opposing cone carved out of the mountain’s bedrock. Yad Vashem is located on the western slope of Mount Herzl on the Mount of Remembrance in Jerusalem, 804 meters (2,638 ft) above sea level and adjacent to the Jerusalem Forest. Yad Vashem is a 180-dunam (180,000 m2; 1,900,000 sq ft) complex containing the Holocaust History Museum, memorial sites such as the Children’s Memorial and the Hall of Remembrance, The Museum of Holocaust Art, sculptures, outdoor commemorative sites such as the Valley of the Communities, a synagogue, archives, a research institute, library, publishing house and an educational center, The International School for Holocaust Studies. Yad Vashem honors non-Jews who saved Jews during the Holocaust, at personal risk, as the Righteous Among the Nations. Yad Vashem is the second most-visited tourist site in Israel, after the Western Wall. It receives some one million visitors annually. Admission is free. Feel for 15, you’ll feel for 6 million.